This is the story of the battle of Iwo Jima told by veterans who returned to the island of black volcanic sand for the 50th Commemoration ceremonies in 1995. They were joined by Japanese veterans on a similar voyage of peacemaking and remembrance. The story begins with the battle of Iwo Jimaand expands to encompass the story of the B-29 bombers, the families left behind in the United States, the Japanese defenders, and the atomic bombing of Japan. Interviewees include former members of the Marines, Air Corps, and Naval Construction Battalion. Returning to the island of Iwo Jima for the first time in fifty years, they revisit the past and reflect on how their war experiences affected them over the years. 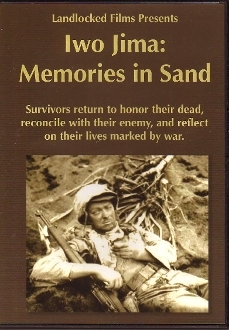 ”Iwo Jima: Memories in Sand was broadcast on PBS, won a CINE Golden Eagle, and screened at film festivals in the US and abroad. We accept institutional Purchase Orders via email. Email us at info@landlockedfilms.com with your purchase order! Copyright © 2012-2019 Landlocked Films LLC. All rights reserved.